Spectators are an integral part of a great race atmosphere. 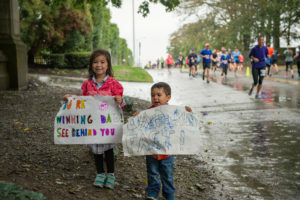 Runners at the Amica Newport Marathon and Half Marathon will be tackling very long distances, and having cheering fans, friends and family along the course is often an extra push of motivation! Hand-operated noisemakers such as cowbells, funny costumes, music, and signs are great ways to cheer on all of the participants. 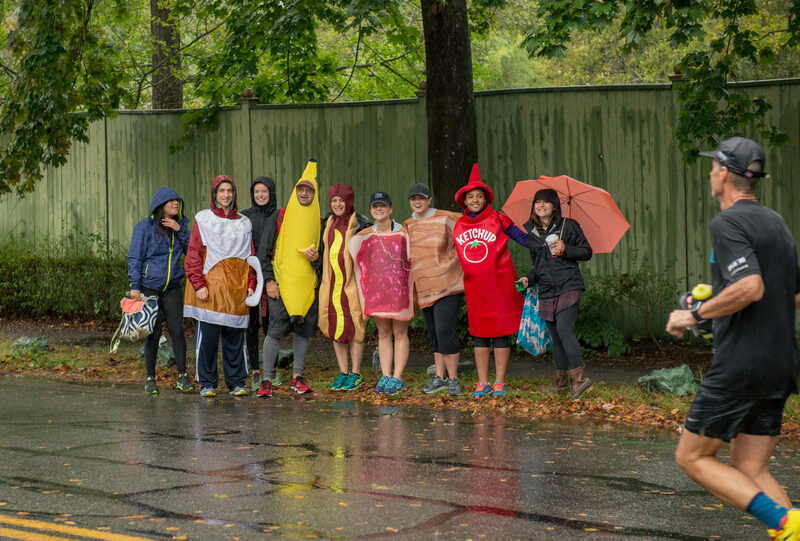 Here’s the scoop on being the best spectators out there on the course this October! Click here for a race map. Spectators are welcome to bicycle or drive to watch their runners. However, cyclists must stay out of the running lane and obey all traffic laws. For those who plan to drive, we suggest driving the opposite way around the course to reach your desired vantage point to avoid runners and the most traffic delays. Easton’s Beach; Mile 0, 13.1 & 26.2 The start and finish area for both the half marathon and marathon is a great spot to watch due to its location as the shuttle drop-off spot. Spectators can park in the designated lots and take the shuttles to Easton’s Beach. After watching the start of the race, spectators can enjoy the sandy beach and beautiful views of Newport and Middletown while awaiting their runners. Both races also finish at this point. For those who are supporting marathon runners, Easton’s Beach is also the halfway mark. A short walk up the hill, the famous Cliff Walk is a great attraction to take advantage of while waiting for your runner to return! Please note there is no parking here; spectators will need to take shuttles from the parking areas in order to get to Easton’s Beach. Be sure to allow for travel time! Fort Adams; Mile 4 This state park offers ample parking and a great opportunity to see your runners early on in the race. By the time they reach Fort Adams, runners have successfully tackled Thames Street and run past the harbor on Wellington Avenue. While you’re at the park, make sure to check out the historic fortress. If the weather is good, follow the 2.5-mile Bay Walk loop around the perimeter of the park for some of the best views of the Newport Pell Bridge and Narragansett Bay. Brenton Point; Mile 6 This spot on Ocean Drive offers some of the most stunning views of Narragansett Bay and the sea that Newport has to offer. With plenty of parking, it’s also a beautiful spot to cheer on your runner as the miles start to add on! Surfer’s End; Mile 15 & 24 The rocky outcropping on Sachuest Point is a hangout for local surfers, and also a great place to catch runners twice! Its proximity to the parking area at Second Beach also makes this an ideal location for spectators who plan to take the shuttle to/from the start/finish. However, keep in mind that if you see your runner at their 24th mile here, you likely will not be able to get to the finish line by shuttle before they finish. Strong cyclists may be able to cover the 2.2 miles remaining before the runners do, but must stay out of the running lane and obey all traffic laws. Memorial Boulevard in front of Easton’s Beach will close at 7:00 AM, traffic will be diverted, and the area will be impacted until roughly 8:00 AM. Thames Street will be closed from about 7:30 AM to 8:15 AM. Runners will remain on roads in Newport until approximately 11:00 AM and in Middletown until approximately 1:30 PM. Empire Tea and Coffee at 58 Aquidneck Avenue in Middletown will be open at 5:30 AM to serve tasty options to both runners and spectators. Empire is an easy walk from the starting area at Easton’s Beach. Spectators may use the shuttles, but runners get first preference. We suggest spectators should use the full marathon parking lot at Second Beach. Get there early if you want to be there for the 7:30 AM start at Easton’s Beach!